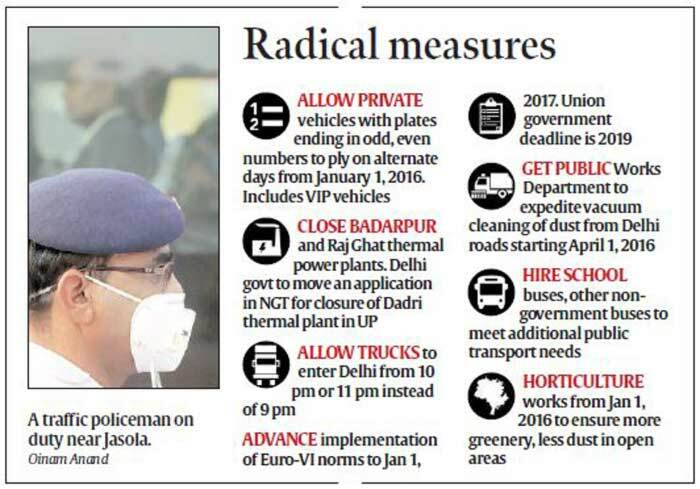 In a bid to curb rising pollution, the Delhi government on Friday decided that odd and even number vehicles will ply on alternate days in the capital from January 1, official sources said. In the first major green intervention by the executive which could become a template for other cities in the country, the Delhi government announced Friday a slew of measures starting January 1 to bring down pollution levels in the Capital. The radical steps, which include restrictions on plying of vehicles, shutting down of power plants, vacuum-cleaning of roads and not allowing vehicle parking on PWD roads, were made public a day after the Delhi High Court, commenting on the city’s poor air quality, said “it seems like we are living in a gas chamber”. At a meeting chaired by Chief Minister Arvind Kejriwal, the government decided to impose curbs on operation of vehicles on Delhi roads based on odd and even registration number plates. Depending on the odd or even last digit on the plate, vehicles will ply on alternate days. This step is aimed at reducing both pollution and congestion on the roads. The number code for vehicles will be effected from January 1 and modalities will be worked out this month, Delhi Chief Secretary K K Sharma told reporters. “Large number of buses like school buses make only one trip in the morning and evening. In addition to these, the transport department and the DTC will hire more vehicles. We are working out the modalities. The next meeting will be held by the Chief Minister on December 8 and we will then decide whether we will observe this for two weeks or three weeks,” Sharma said. Also Read: Curbing Delhi pollution: The Big Question, How? The odd and even number operation will not apply to ambulances and other vehicles used for maintenance of law and order, he said. “Exemptions will not be made based on VIP vehicles, it will be need-based,” Sharma told The Indian Express. Whether this will prompt people to buy vehicles with both odd and even numbers, he said, is a “risk we will have to take in society.” He said China has implemented the odd and even number operation effectively. The environment department and the Delhi Pollution Control Committee (DPCC) will consider issuing orders to close the Badarpur and Rajghat Thermal Power Plants which, he said, are contributing in a major way to air pollution in Delhi. He said alternative arrangements will be made for power supply. The Delhi government, he said, will also move the National Green Tribunal (NGT) to seek closure of the thermal power plant in Dadri, Uttar Pradesh which is “contributing to air pollution in Delhi”. The decisions came two days after the NGT came down heavily on the government, asking it to identify “critically polluted areas” and issue “immediate advisories” to the public. Sharma said the entry of trucks into Delhi that begins at 9 pm is proposed to be pushed beyond 10 pm or 11 pm. “A large number of people are still on the roads at 9 pm in Delhi. As trucks are allowed at 9 pm, they drastically slow down other vehicles on the road and people, who would otherwise spend 30 minutes on the road, end up spending 45-50 minutes. We are also told that after entering at 9 pm, trucks ply till about 2.30-3 am. If they are allowed after 10.30-11 pm, they can ply till about 4 am,” he said. The transport department, he said, will conduct rigorous checks to ensure that trucks entering Delhi have valid pollution certificates. “The cut-off date for implementation of Euro-VI emission norms for India has been fixed at January 1, 2019. Delhi government has decided to advance it to January 1, 2017. Delhi government will make all efforts to meet this new self-imposed deadline,” Sharma said. Government officials said it was also decided to crowd-source complaints relating to visibly polluting vehicles and burning of bio-mass, garbage, leaves, etc. using Information Technology. The Urban Development Department will modify its recently launched Swachh Bharat mobile app so that complaints can be received from the public and forwarded for action. In addition, it will also undertake a “massive greening project” on kutcha roads in the next three to four weeks. MCD parking spaces on PWD roads of Delhi “creating chaos on roads will be closed down” and the PWD department, Sharma said, is being directed to take effective steps to implement these decisions at the earliest. 3 Curbing pollution in Delhi: The Big Question, How?